... next came the ‘Tamerlane’ or ‘Timur’ section of the complex. There inside the Winter Hall we were completely alone. 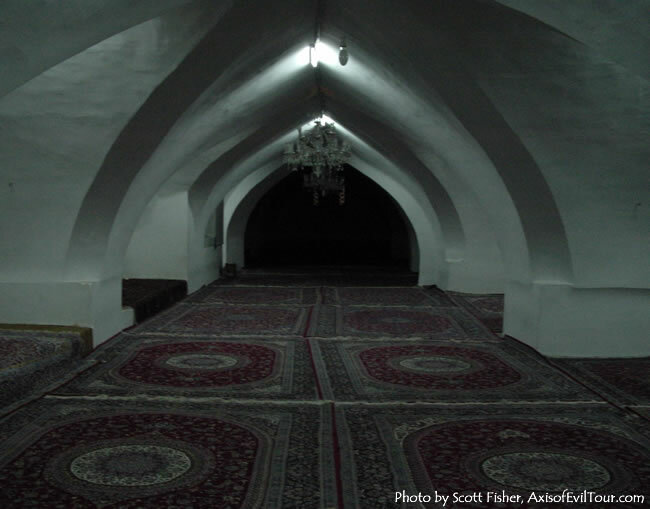 Old prayer mats stretched around the columns and into the dark corners of the cool, eerily quiet prayer hall. Local called us over near the entrance, next to the light switches, and suddenly plunged the room into darkness. A wan January light gradually began to filter into this room deep inside the complex. The carpets and low, curved columns slowly came back into view. Except for the American standing there, the 600-year old hall was exactly as it would have been when it was built.